A Steam key will soon be required to play. Frontier is making a theme park sim, in case you hadn't noticed: a spiritual successor to its RollerCoaster Tycoon series. Andy got his hands on the early access version back in March, and reckoned that it was "shaping up nicely"; you may have your own opinion, as it's currently possible to buy your way into that early access via the official site. Wait, it's not on Steam? Not yet! But Frontier has emailed fans to reassure them/warn them that a Steam version is on the way. And that everyone who's bought the alpha version, or pre-ordered the full game, will get a Steam key. But you'll be able to continue playing outside of Steam, right? Nope! In an FAQ, Frontier reveals that "Planet Coaster Alpha 3 will build on Steam Workshop features and so requires access to Steam to play. You will not be able to use the Frontier Launchpad to play Planet Coaster from Alpha 3 onwards". Alpha 3 is scheduled to arrive on August 23, and if you want access you'll need a Steam account, although it won't be possible to BUY Planet Coaster on Steam until the beta. You can continue playing Alpha 2 with the Frontier Launchpad until shortly before Alpha 3 appears, at which point the old version will no longer be supported. Furthermore, Frontier will be stopping new purchases of the Alpha on August 25. If you miss that window, you'll have to wait until the game launches at the end of the year. 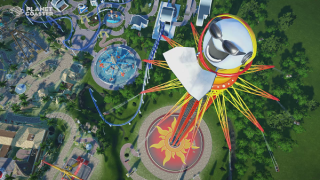 The beta version of Planet Coaster will start at some point after Alpha 3 (the dates haven't been announced yet).